An early start to learning – at each child’s individual pace. 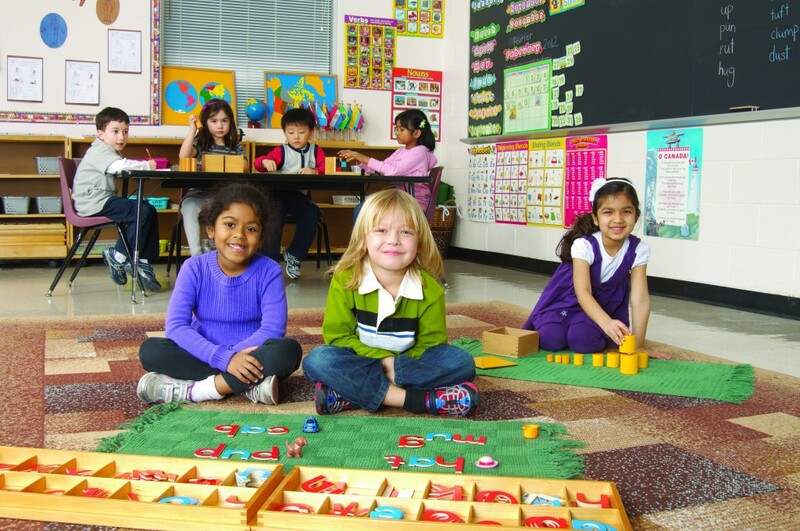 The Montessori program is based on a well known philosophy and teaching methodology. 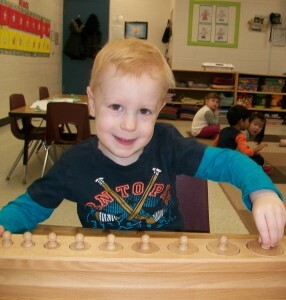 Students learn in an inviting and intellectually stimulating classroom led by Montessori trained teachers. The students are treated as individuals and are allowed to progress at their own pace and level of understanding with gentle guidance from their teachers. The Montessori classroom is fully equipped to provide children with a well-rounded education in which they are constantly learning at a conscious and subconscious level. It also capitalizes on the children’s “sensitive periods” by providing them with an environment that is full of interesting activities, leading to a strong academic foundation that will benefit them throughout their entire academic careers. Learning is a lifelong process, as Dr. Maria Montessori discovered very early in her career as an educator. Here are some tenets on which Montessori education is based. Learning begins immediately from the time a child is born. Dr. Montessori strongly believed that children have “absorbent minds” and if exposed to information in a stimulating environment they will easily understand and internalize the information. Children go through “sensitive periods” between the ages of 2 and 5 when they have optimal learning abilities. 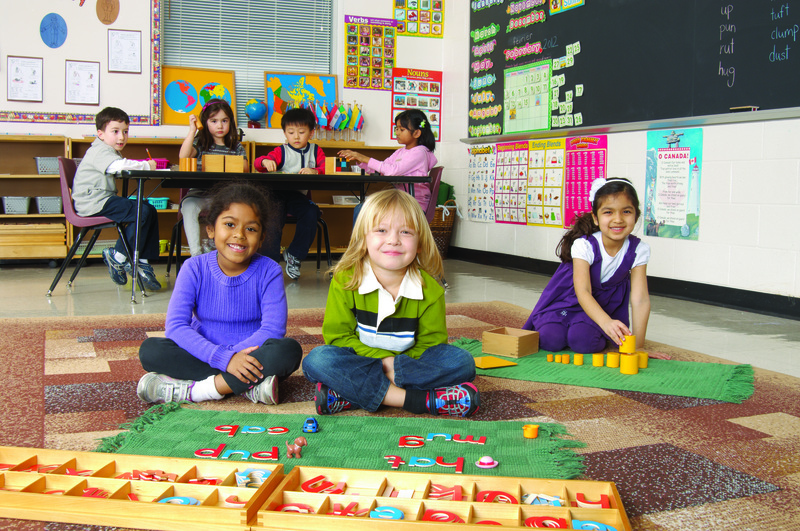 A Montessori classroom is set up to maximize the amount of learning during these sensitive periods. The Practical Life activities in a Montessori classroom encourage and teach children the correct use of everyday materials. Toys are not used for this purpose. 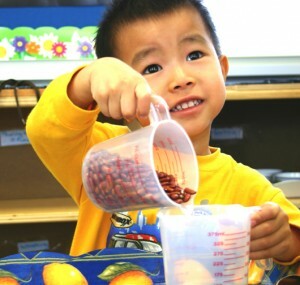 Instead, a Montessori teacher designs specific activities that are scaled down to the child’s size so that the child can learn to complete them correctly. Sensorial materials are another integral part of the Montessori methodology. Sensorial materials are designed with a dual purpose. On a conscious level, these materials aim to develop the child’s discriminatory skills using their 5 senses. On a subliminal level they prepare the child for later work in Writing, Mathematics, Geometry and Visual Arts. They are designed to create activities with specific objectives in mind such as to isolate the senses and initiate comprehension of various concepts. The activities lay the foundation of the child’s comprehension and help the child distinguish between qualities in objects. Children are able to manipulate various apparatus in each of these categories and make discoveries in their environment. According to the Montessori philosophy and methodology, numbers are absorbed while using the sensory materials in the 3 to 6 year old period. Each of these categories helps lead the child progressively from their initial encounter with numbers to doing complex mathematics on an abstract level. 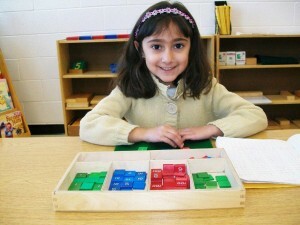 All of this is achieved through manipulation of the extensive Montessori materials available in the classroom. The language component in a Montessori classroom is comprised of a large array of interesting and intellectually stimulating materials. The child progresses from learning the phonetic sounds using sandpaper letters, to building non-phonetic words, sentences and finally paragraphs. The material is progressive in its design allowing the students to continually challenge themselves and build on what they already know and understand. For example, if a child has used the “small movable alphabet” to build non-phonetic words and is ready to build sentences, the teacher in a Montessori class will introduce the child to grammar and guide the student to build correct complex sentences. Culture activities include a combination of Science, Geography and History activities. Dr. Montessori believed that children could benefit from early exposure to all aspects of education. 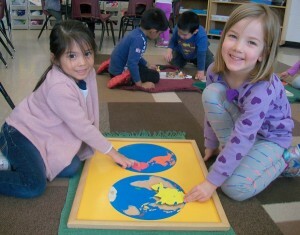 Children greatly enjoy this area of the classroom because they are naturally very curious about the world around them. They learn to see and analyze their environment scientifically and this helps form the foundation of analytical and scientific thought.